Although this year has been a crazy, difficult, wonderful, stressful, mash up of unexpected twists and turns, I have tried to savor the small moments with my family. That isn't always easy when we are being pulled in a million different directions. I may not always succeed at making the most of each moment with my kids, or even at just getting through they day without arguing, pleading, complaining or yelling (yes, guilty and it kills me). But, I have at least tried to tell them a million times how much they mean to me and to capture the small moments and document their growth. I don't want them to remember me as a ball of stress who works all the time and ignores them while I spend hours editing photos of other seemingly happy families. But, at this point in our lives, I don't have much choice as far as the work goes. So, my resolution is to try to find more balance. To try to be more present and more thankful for our little victories. To remember that even when life is crazy-busy-stressful and I am facing a mountain of work/housework/school work/bills and a long list of needs and wants by those all around me, that this life is a gift. Each day is a gift. And it is my responsibility to make the most of it. After all, I wouldn't want to lose any part of it, and one day I will miss the crazy. 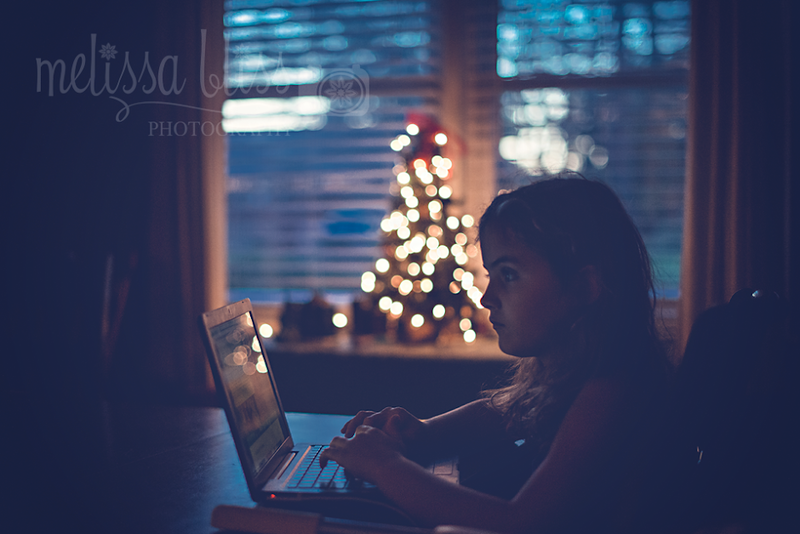 Last week, as the sun was setting, I caught a glimpse of my daughter working on her computer by the light of our little Christmas tree. I imagined her in college, doing the same thing, and the years flashed by before me. It all goes too quickly - the days, the weeks, the years. We have but mere string of moments with our children before they grow and change and fly from the nest. Savor every one. What a sweet image - she looks so mature there! Enjoy your holiday! !